It seems to me that people who research their family history share an important trait: empathy. Empathy for people long dead, whose lives played out before we were even dreamt of. Nowhere is this more keenly felt than in the loss of a life cut suddenly and tragically short. I feel for you, my soul whispers to theirs, across time and space. I’m sorry. Marshal Clark, aged 60, a farmer residing near Sunbury, was fatally injured when his team ran away in Sunbury at 8:30 Thursday morning. The team became frightened at a passing train and bolted, dragging Mr. Clark a distance of 100 yards. After examination by Sunbury physicians he was taken to Mt. Carmel hospital, Columbus, where he died at noon. Mr. Clark had driven his team and wagon into town during the morning and while the wagon was standing near a railroad track a train went by, frightening the team of young horses. 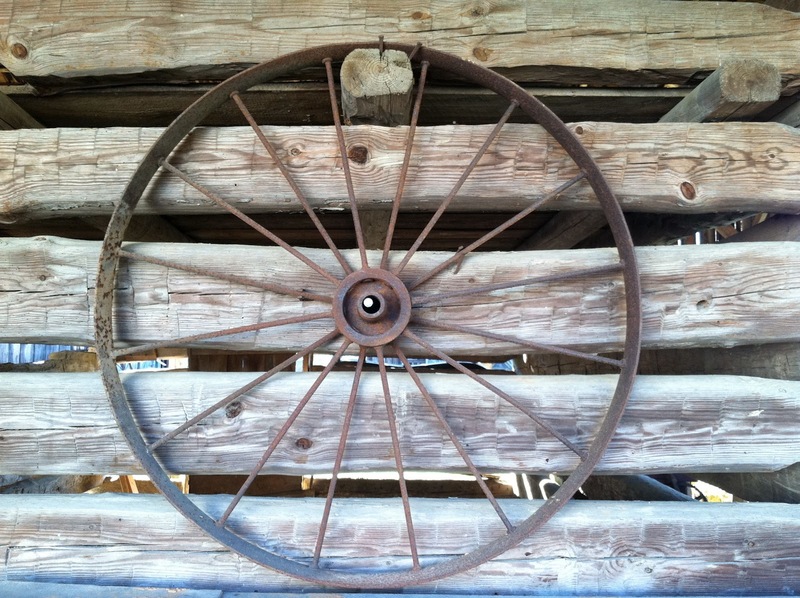 The wagon was overturned and Mr. Clark was caught in the harness and dragged. His skull was fractured and he sustained numerous other broken bones and probably internal injuries. Mr. Clark is survived by his wife, one son, one daughter, Mrs. Charles Ballenger, of Westerville, two grandchildren, aged parents, one brother and a sister. I can imagine his wife, Rose, doing the wash or other routine chores that day. Perhaps she was already cooking the noon meal so it would be ready for Marshal’s return. She had probably asked him to pick up a few things for her while he was in town. Suddenly a horse comes galloping up to the farmhouse, its breathless rider dismounting. His news will break the sweet mundane tranquility of her day, of her life. Marshal Clark one of our highly respected farmer citizens received injuries last Thursday which resulted in his death Thursday noon. 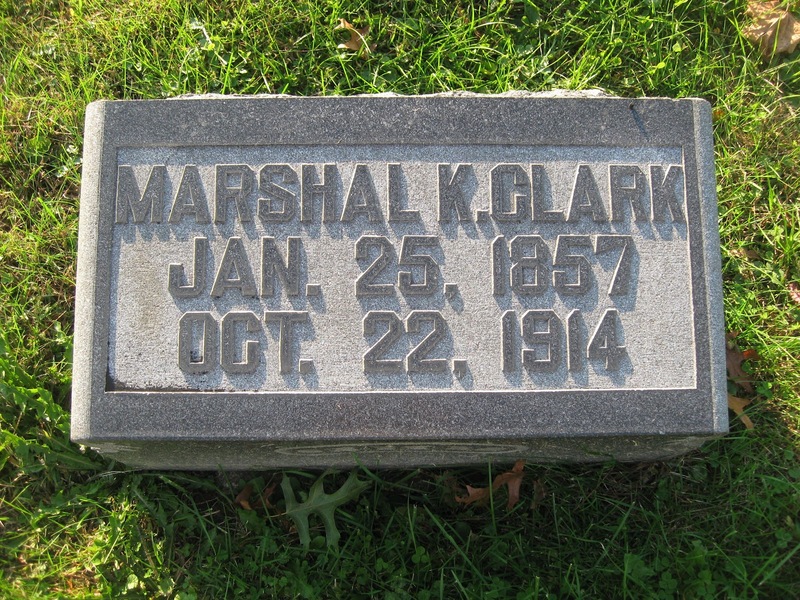 Marshal Clark, son of James and Martha Clark, was born January 25, 1857 and died October 22, 1914 at the age of 57 years, 8 months and 25 days. He was married to Rose E. Edwards January 17, 1886. Their union was blest with two children, one daughter Mrs. Chas Ballenger of Westerville and one son, Mr. Wm. Clark still living on the old homestead in Trenton Tp. Delaware County. Mr. Clark united with the M E Church at Wesley Chapel some twenty years ago, was baptized and was a firm believer in the power of the blessed Redeemer. He was a quiet inoffensive man ever ready to deny himself that he might lend a helping hand to others, as a husband he was without fault, as a father he was devoted to his children, as a neighbor to the full extent of the word, neighbor; as a friend kind and true. He leaves to remember him a devoted wife, one daughter, a son, a daughter-in-law, Mrs. Wm. Clark, a son-in-law, Mr. Charles Ballenger, two grand children, an aged father and mother, one brother, and one sister, Mrs. Thurston of Centerburg. When we drift to eternity’s shore. On the shores of a beautiful land. Does it seem to you that family historians have an extra dose of empathy? “Runaway Accident,” Public Opinion (Westerville, Ohio), 29 October 1914, p. 1, col. 1. “Marshal Clark Dies,” Sunbury News (Sunbury, Ohio), 29 October 1914, p. 1., col. 1. I'd not thought of empathy in terms of the research, but you are so right. As academic as the research is, it is also intensely personal. You do have the perfect blog title - A Sense of Family. Yes, I agree. Without empathy, family history would be just about "pedigree" -- as some people think it is. I really like your meditation about how it must have been for Rose Clark to receive the news of Marshal's death. That feeling carries across the years. My grandfather was ambushed and shot in the early 1900s (although he survived), and I've written about that incident with exactly your kind of meditation, thinking of my grandmother and her young children. Empathy spurs us through all that research. Your opening paragraph was beautifully written and spot on. Great post! I do believe family historians have an extra dose of empathy. I can think of more than one incident when I actually went into mourning after uncovering a sad or tragic story. You have to stop and remind yourself that the event happened a very long time ago. I agree about the empathy we all feel for our ancestors (and those of others!). 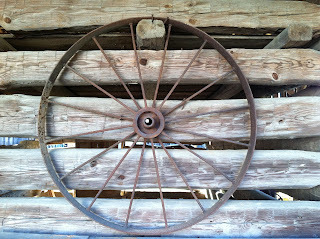 How personal history becomes when we can picture ourselves in their shoes. Thanks for sharing this. Oh, how horribly sad, Shelley. One can only hope that he was unconscious very quickly after the accident so that he didn't suffer much pain. There are accidents happening all around us every day but I think we feel it most when it's a relative, whether living recently or an ancestor.